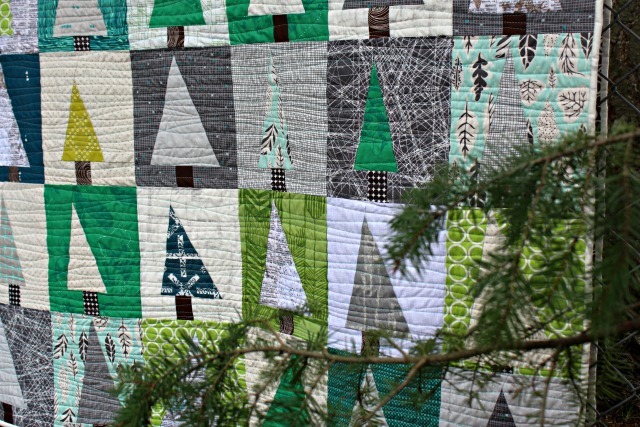 Throughout last year's Christmas rush, I saw oodles of folks making a Patchwork Forest quilt, and I admired them all. That led to me impulsively starting one of my own, knowing full well I'd be making it for this year. And why not, right? The unofficial Christmas colors around here focus on green, and in making our tree skirt and lap quilt in year's past, I've added in aqua/teal, gray, and even brown. So of course that's what I did again, which makes it very foresty, in my humble opinion. I pulled quite a variety of fat-eighths and partial fat-quarters from my stash for the blocks, so along the way, this became an effective stash-buster. 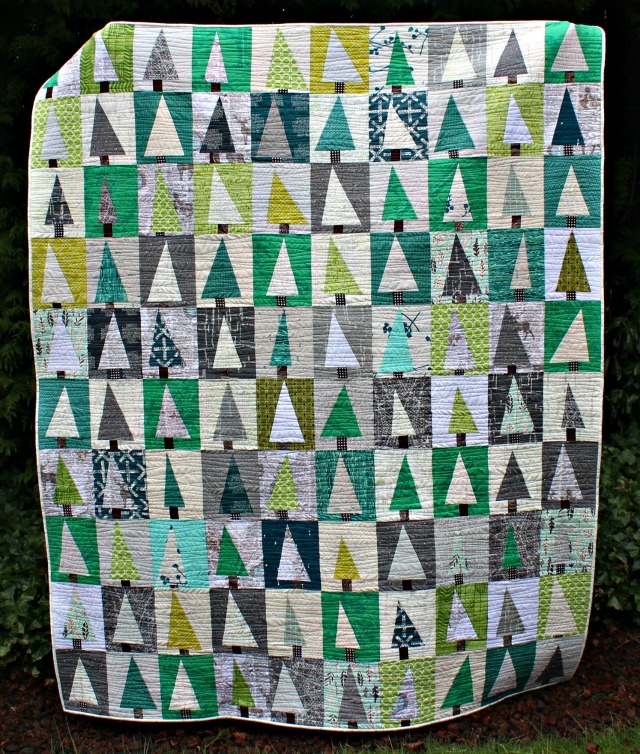 I used the Modern Christmas Tree block tutorial by Amy/Diary of a Quilter, which is a larger version of her original Patchwork Forest Quilt tutorial. The trees are cut improvisationally, then trimmed up. For some reason, mine came out slightly smaller than Amy's (7" x 9") - creator error I'm sure - measuring 6 1/2" x 8" finished. Arranged 10 blocks by 10 blocks, the quilt finished at 65" x 80". 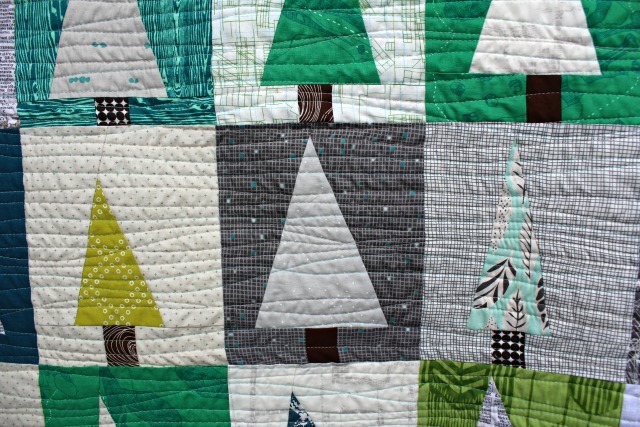 For quilting, I chose organic straight-line quilting horizontally across the quilt, hoping it would give a hint of strings of tree lights. I used Aurifil 50wt #4060 (Silver Moon), which is variegated, and #5006 (Light Turquoise), and the combo made quilting fun. Binding is the subtle but lovely Maze Clarity from Katarina Rocella's Imprint, which was also used in some of my blocks and is one of my very favorite low-volume prints. So there! I am thrilled to have this one out of the way and ready for Christmas, as we all know it'll be here before we know it. Check out other versions of Patchwork Forest on Instagram, under hashtags #patchworkforest and #holidaypatchworkforest. But be careful, or you'll be making one too! This project was on my 2017 Finish-A-Long Q1 list, so I'm off to link up just in the nick of time! Also linking up with Finish It Up Friday! What a wonderful quilt. It reminds me that I had it in my mind to make one,too ☺. I like this pattern a lot. It's gorgeous!!! I love it! What a wonderful Christmas quilt. The colors are wonderful, and the quilting is just perfect for this quilt. Ohhh my that is totally awesome!!! I love it!! The colors are great. Repeating myself here I know, but I love your color choices. This is a winter quilt to me, not just Christmas. On my growing list of projects I'd love to do. Great quilting! Yes, this has been on my list for awhile. I love the color choices you made. It's gorgeous!! Love it! Awesome job! What a beautiful forest! It will be a perfect quilt for next Christmas and winter time, and many others to come. The story of the quilt making is also quite an enchantment! Beautifully foresty, these colours. As always, a beautiful finish Debbie! I love all of your makes so much. Thank you for participating in the FAL, on behalf of the 2017 global FAL hosts. 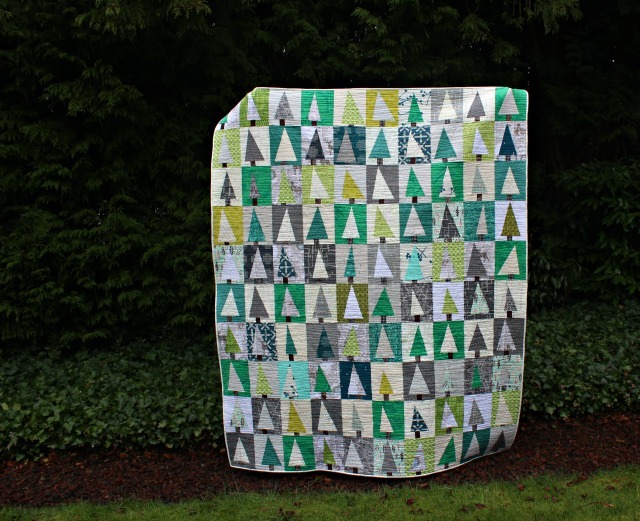 Such a beautiful quilt - love all of the different shades of green and how well it goes with your "Maisy" quilt. When you look at a forrest of trees you are struck by all the different shades of greens greys, browns, and a whole host of others. You have captured it wonderfully well. I love your forest and you are going to be so organised for Christmas this year. I love this quilt. I think your choice of colours is perfect, as is your quilting! This is wonderful! It's holiday...but not over the top! Just love the mix of colors! Well done! Great quilt ! I love how you mixed green and aqua. 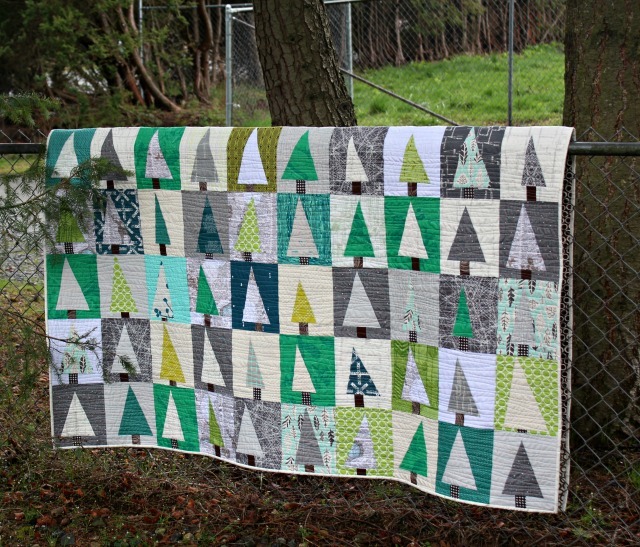 You might just be right, the more christmas tree quilts I see the more I want to make my own. You could stitch some beeds on just one of the trees as a highlight so it will really have christmas lights on it. Debbie, another fantastic finish! Congrats on getting it done just in the nick of time too. (Am I spelling that expression correctly? nick?) Hmm. Anyways it is a beautiful quilt that now you will enjoy this Christmas! Those may be what we think of as Christmas trees, but they could be just an evergreen forest. I say it's too pretty to be out just for the holiday season. I'd display and use it all winter. Great quilt, Debbie. I think the wavy lines are fantastic and I can definitely see them as strings of lights. I am impressed that you are done and ready for the holiday this year! This one just brings a smile to my face. I love green and it reminds me of all the trees we saw on our Seattle visit. Love your version! I have been wanting to make a quilt for Pantone's 2017 colour: Greenery....this pattern would be perfect. Oh no, another quilt I really don't have time for.